Recombinant fragment corresponding to a region within amino acids 1-313 of Human ASPA (Uniprot ID P45381). Mouse brain whole cell lysate. HeLa cells. Our Abpromise guarantee covers the use of ab154503 in the following tested applications. WB 1/5000 - 1/20000. Predicted molecular weight: 36 kDa. Brain white matter, skeletal muscle, kidney, adrenal glands, lung and liver. Defects in ASPA are the cause of Canavan disease (CAND) [MIM:271900]; also known as spongy degeneration of the brain. CAND is a rare neurodegenerative condition of infancy or childhood characterized by white matter vacuolization and demeylination that gives rise to a spongy appearance. The clinical features are onset in early infancy, atonia of neck muscles, hypotonia, hyperextension of legs and flexion of arms, blindness, severe mental defect, megalocephaly, and death by 18 months on the average. Belongs to the AspA/AstE family. Aspartoacylase subfamily. 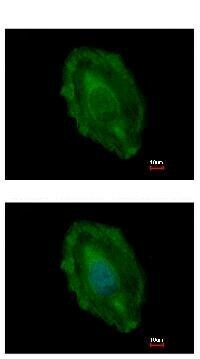 Immunofluorescence analysis of paraformaldehyde-fixed HeLa cells labeling ASPA using ab154503 antibody at 1/500 dilution. Lower panel shows costaining with Hoechst 33342. Publishing research using ab154503? Please let us know so that we can cite the reference in this datasheet. There are currently no Customer reviews or Questions for ab154503.